Continuing our exploration of the architecture of nature, Van Gregory & Norton introduces the Oculus line of convex mirrors, each a unique and radiant art object hand crafted in the company's Brooklyn studio, blending innovative design with a wide variety of contemporary and traditional finishes. Oculus mirrors are built on a skeletal frame of concentric bamboo, wood and papier-mâché. The substrate is enrobed in 15 layers of Bolognese gesso finished with traditional water gilding in 22-karat gold, 16-karat pale gold, 12-karat white gold, or silver leaf finishes with either red, yellow or grey clay bole. Additional finishes include oil gilt copper leaf, matte white gesso, antique waxed gesso, gloss candy lacquers, and a burnished black gesso finish. The mirrors are backed by hand-marbled endpapers, textiles or leather. The six Oculus frame styles are Bull's Eye, Coin, Hive, Port, Sun and Twig. 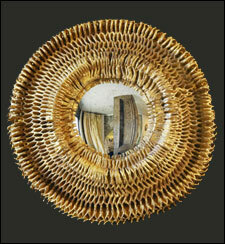 Antiqued or clear glass convex mirrors range in diameter from 6 - 30 inches. Frame dimensions range in diameter from 16 to 40 inches. Prices are available on request.